What’s the Status of India’s Light Combat Helicopter? The HAL Light Combat Helicopter recently completed crucial trials. A prototype of the Light Combat Helicopter (LCH), currently under development by Hindustan Aeronautics Limited (HAL) for the Indian Army (IA) and Indian Air Force (IAF), recently completed hot and high altitude trials, the Business Standard reports. The twin-engine 5.8-ton third and final LCH prototype performed several landing and take-off tests at military outposts in Ladakh and, for the first-time ever for an attack-helicopter, landed at a military base in the disputed Siachen Glacier region in Kashmir. “The flight trials at Leh have established hover performance and low speed handling characteristics of the helicopter under extreme weather conditions at different altitudes (3200 to 4800 m). During the trials, the helicopter and systems performed satisfactorily,” according to the chairman of HAL, T. Suvarna Raju. In February 2015, the LCH successfully completed “cold weather flight trials” in Ladakh and in June “hot weather flight trials” around Jodhpur. 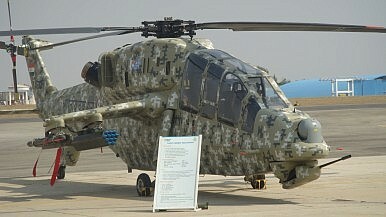 “The performance and handling qualities of the helicopter have been established for basic configuration (with electro-optical pod, rocket launchers, turret gun and air-to-air missile launchers)… Further development activities are under progress and the weapon firing trials are planned during in the middle of 2016,” according to a HAL press release quoted in the Business Standard. The LCH, which made its maiden flight in May 2010, has been specifically developed in response to the lack of an attack helicopter capable of performing high-altitude operations during the 1999 Kargil War. Consequently, the LCH, a derivative of the HAL Dhruv helicopter, has been primarily designed for high-altitude warfare–HAL and French engine-maker, Turbomeca jointly designed a special engine optimized for extreme altitudes–and has an operational ceiling limit of 6,000–6,500 meters (19,700–21,300 feet). However, the LCH can be used for a host of different mission sets including air defense (against UAVs), battlefield surveillance, as well as general counterinsurgency and combat search and rescue operations. It can also be configured for anti-submarine and anti-surface vessel warfare. The armored attack helicopter’s weapon suite includes a 20 mm French Giat-Nexter turret gun, four Belgium-made 70 mm anti-tank guided missiles (or, once operational, the Indian Helina anti-tank missile, which is still in development) and MBDA Mistral-2 air-to-air missiles. SAAB South Africa is providing the LCH’s electronic warfare suite. So far the Indian Army’s Army Aviation Corps (AAC) has ordered 114 helicopters and the IAF 65. However, IHS Jane’s Defense Weekly reports that this number is slated to increase to 180 given that the army wants to deploy the new helicopter to all of its 13 corps and other formations. Once the LCH obtains initial operational clearance (IOC), it is slated to enter serial production at the end of 2015. The Light Combat Helicopter will undergo weapons tests in July and August.